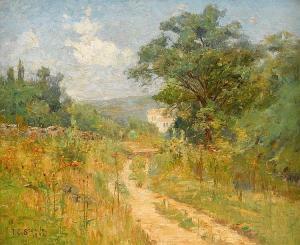 Find artworks, auction results, sale prices and pictures of Theodore Clement Steele at auctions worldwide. 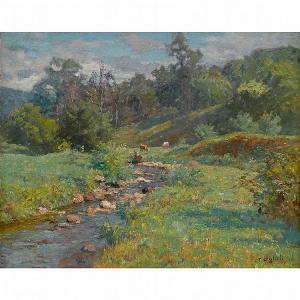 THEODORE CLEMENT STEELE (American, 1847-1926) autumn landscape unsigned, o/c, 30 by 40 in., frame appears original Authenticated on reverse: THIS IS THE WORK/OF/T. C. STEELE/AUTHENTICATED BY/Mrs. T. C. Steele/August 31, 1926 From an Indiana family. Paint loss upper right and upper left edges in sky area. signed and dated lower right: T.C. Steele / 1915, titled on the stretcher. Note: T.C. 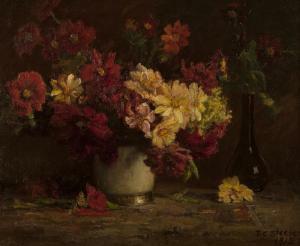 Steele befriended writer Gene Stratton Porter (1863-1924) through their mutual love of flowers, particularly dahlias. The youngest of twelve children, Porter started writing as a child. She married Charles Porter in 1886 and by the late 1890s regularly submitted articles to magazines such as Ladies' Home Journal, McCall's Magazine and The Metropolitan Magazine. She initially published anonymously so articles that might not be well received did not embarrass her husband. Eventually, she did publish articles and books in her own name on birds, flowers and nature, and through her work made the acquaintance of Indiana artist Steele. Family oral history suggests that Porter commissioned Steele to paint the present still life depicting a central vase bursting with multi-colored dahlia blooms. The original long-necked brown vase seen at the painting's right is in the collection of the T.C. Steele State Historical Site in Nashville, Indiana. 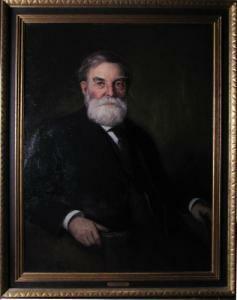 Provenance: Gene Stratton Porter, friend of the artist; by descent in the family to Private Collection, Redondo Beach, CA. Condition: Visual: Generally good condition. Minor frame abrasion, heavier along the lower right edge. Blacklight: A 1'' x 3.5'' 'J'-shaped area of touch-up with corresponding patch verso in the center. A 1.75'' x 1'' scattered area of touch-up in the upper right corner. /spanPrivate Collection, Hanover, New Hampshire. Private Collection, West Chester County, New York. Excellent original condition; the canvas is not relined. There are some barely discernible tiny missing paint flecks at lower left. Frame: 25 3/4 x 30 5/8 in. Mr. Shoulter, Saint Louis, Missouri. Carolyn Shoulter O'Hara, Saint Louis, Missouri. Cindy Neal, Saint Louis, Missouri. McCaughen & Burr, Saint Louis, Missouri. Acquired from the above, October 28, 1982. Private Collection, The Main Line, Pennsylvania.